YOU DECIDE THE PRICE RESTAURANT!! One World Everybody Eats is located at 41 South, 300 East beside the Utah College of Massage Therapy near downtown Salt Lake City The kitchen is open 7 days a week from 11 a.m. until 8 p.m. There is a main dining area near the kitchen and five, semi-private dining areas both upstairs and downstairs. Guests may also eat at patio areas in front and behind the restaurant. Total seating capacity is about 60. The kitchen has no set menu. This lets the cooks use their creativity to prepare a variety of seasonal soups, salads, entrees, and desserts. The food stuffs are all-organic and the cuisine ranges from vegeterian to meat. There is a large vegan selection. The cafe provides water, coffee and teas, regular and soy milk but no soft drinks or alcohol. You may bring non-alcoholic drinks if you like. One World Everybody Eats asks guests to pay what they feel the meal warranted. This requires guests use their fairest judgement. Although the kitchen is a non-profit establishment, it still must meet regular business expenses. Guests are asked to consider this when visiting. WIZARD OF OZ PHOBIA GARDEN!!! Ever since she was a little girl...THE WIZARD OF OZ and everything about it WAS HER PHOBIA!!!!! She stated that anything to do with the land of OZ scared her to death. She had this fear...even till NOW!!! So in order to be comfortable with her fears...she gave her business garden a Wizard of Oz theme!!! She still says it kind of freaks her out when she comes to work each day, but she is more at peace with the terror that is the Wizard of Oz. During Halloween, this garden becomes a pumpkin patch to truly become a Haunted Oz!! 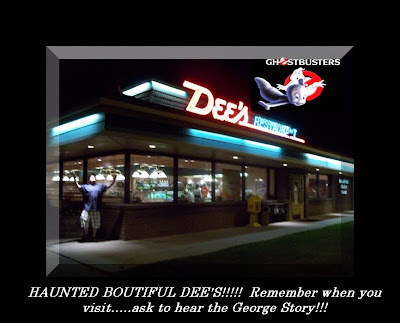 HAUNTED DEES RESTAURANT - Bountiful Utah!!! Once in the early 80's there was an employee named George. 1. George was shot by another employee. 3. George was locked in a chicken coup in the basement. 4. George was hit by a car in front of the restaurant. 5. George was poisoned by the cooks. Here is the story I like the most. George worked his way up from dishwasher to server and was in line to be cashier. During the interview process the other competitors for the position lured him down in the basement prior to his interview. They locked him in the chicken coup in the basement (there is a chicken coup in the basement). No matter how loud and long George screamed...no one could hear him. George eventually died in the basement. Since then, George sightings are daily. At night on the Surveillance Cameras you can see George wander the restaurant and eventually work his way over to the position he always wanted....cashier. Now I have seen the tapes, it really does look like a ghost wandering the restaurant! So maybe one of the above stories could be true???? Go see for yourself and remember to ask about George. THE $13 MILLION DOLLAR MOON ROCK!!! Salt Lake City's Clark Planetarium has on permanent loan from NASA a Moon Rock worth $13 million dollars!!!! This is Salt Lake Counties most valuable displayed artifact! Take that Atlanta's $11 million dollar moon rock!!! 1. The $13 million dollar moon rock was obtained from the Apollo 15 mission. 2. There is a video playing near the sample which has actual footage of the Apollo 15 Astronauts collecting the displayed sample rock. 3. There is a hidden security camera directly above the rock and one more above the astronaut outfit near by. 4. There is a full time REAL police officer patrolling the Planetarium guarding the rock. 5. The snack bar downstairs has "Pomegranate" Tootsie pops!! Ask for the red wrappers with the red lettering. This is the only place I have ever seen them!!!! And they are only 0.25 cents!!!! YES!!!! This rock is simply encased in plexi-glass case and a plexi-glass triangle mold??? Shipwrecked boats in the Great Salt Lake. THE GREAT SALT LAKE SHIPWRECKS!!! During the hay days of Saltair and the age of the railroads prominence in Utah, tug boats were common place throughout the Great Salt Lake. The Union Pacific decided to abandon its main wooden trussle bridge from Ogden to Tooele across the lake. A more secure rock and gravel bridge was to be constructed. Two tugboats and a ferry were left to take customers and assist travelers across the short cut to Tooele / Ogden. One night a storm came across the Great Salt Lake and pulled the two tug boats from their anchors. The tugboats went missing in action as if some sort of Salt Lake Triangle sucked them up into oblivion. As the dirt tracks began to be built the engineers ran into a problem, the rocks were not settling correctly. They dove into the whole 15 feet deep water (Great Salt Lake is only 20 feet deep) and discovered the two missing tugboats. Rather than pull them up, the workers decided to just build around them. As the lake has receded over time, you can now see the boats. Unfortunately you can't get to the boats or the old wooden trussles without the assistance of a boat. So if you can get a boat...I will tell you the secret on how to find these boats. But Beware....maybe there is a Great Salt Lake Triangle!!! !